I began working at Kingsburg Orchards when I was very young. I don’t really remember the exact time in my life, but my dad would get me out there and show me the ropes. Over the years, what process or technology do you think has been most helpful? Why? And not a single employee feels like they’ve been tortured. We’re enjoying the season and all of its perks. While visions of Dino Eggs dance in Mike J’s head. For those of you who follow us on Twitter, you may have seen our November 1st post, but if not I'll quote it here: "Start the month off right: make a list of 5 things you are thankful for today. Add 1 thing each day until Thanksgiving. Share your list." Our friends at the American Academy of Chefs and the American Culinary Federation will be creating some fabulous recipes for us, which will be featured on our Chef's Corner on a rotating basis - as well as a little bit about each of them. 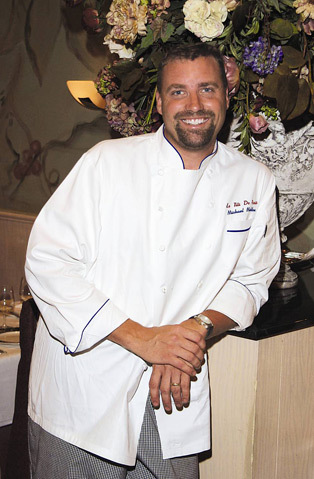 Our featured guest for fall 2011- summer 2012 was Chef Michael Maddox of Le Titi De Paris in Arlington Heights, Illinois. Stetson loves life on the ranch and has a constant companion in his white lab, Spit. He just turned 2, and is at that stage where every fruit is an “apple” and he wants to do everything just like his dad. Whether this is picking fruit from the orchards outside their house for his mom, or hopping on his battery-operated quad to “change the water” (a process of driving a few rows from the house and tapping on the water tank) or just sitting on the tractors and pretending to shift gears and haul fruit to the shed - this little man is happy to be a farmer-in-training. Brent Jackson has been farming his whole life, from turkeys to row crops to stone fruit. Brent grew up in Kingsburg, California with his parents George and Colleen, his older brother Mike and his younger sister Susan. He attended Kingsburg High school where he played football and track when he wasn’t working on the farm. This year is Owen's first year of kindergarten. He's pretty excited to learn new things and make new friends - and he definitely knows what makes the perfect back-to-school snack: his Papa George's Crunchy Gold Apple Pears. When did you start working for Kingsburg Orchards? I started working for the Jackson family in 1990. How has the produce industry changed over the years while you have been here? The biggest change this industry has seen has been a result of the computer. We now have inventory systems, e-commerce platforms, accounting systems, etc... The produce industry is now almost paperless. It has been a very tough transition for those of us who used to write orders on napkins and matchbooks. Ryan's son Carter kicks off our Next Generation video series with a word about farming. Many of you are familiar with the Jackson family and their ever growing group of future “flavor farmers” and today, we are introducing Johnny Diepersloot. What soil and climate have nurtured the fruit on your farm?